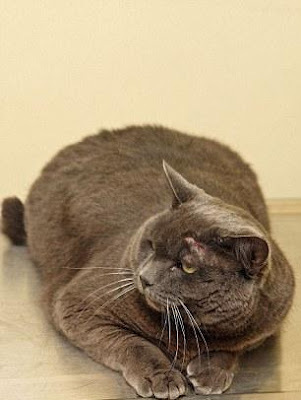 His owner apparently hadn't noticed that Socrates was getting a little pudgy. 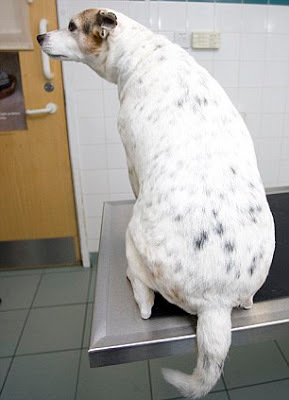 As you can see from her face however, the vet's nurse realised straight away. 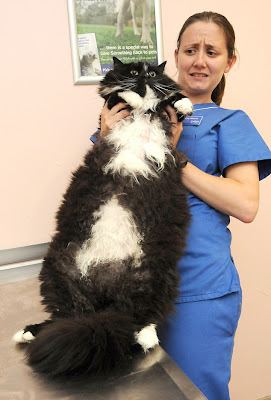 At a whopping 22lb, the black and white heavyweight in Jenny Doig's arms is more than double the size of a normal cat. Owner Bill Duncan, 52, had taken Socrates to the vet worried by his lack of get-up-and-go. The verdict, not surprisingly, was that he was simply too fat to move, possibly because of his taste for cheese and onion crisps. Twice a day, regular as clockwork, he had managed to stagger to his paws and miaow for his breakfast and tea. Now however, meals are a little disappointing. 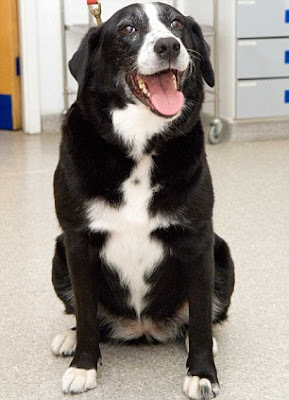 Five-year-old Socrates has been chosen as one of nine finalists in Pet Fit Club, the PDSA animal charity's annual diet competition. 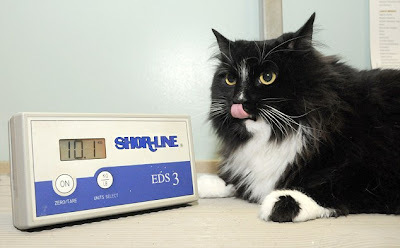 With just 100 days to reach his target weight of 9.9lb, he gets two 50g helpings of prescription diet food a day. That's about half of what he used to eat. 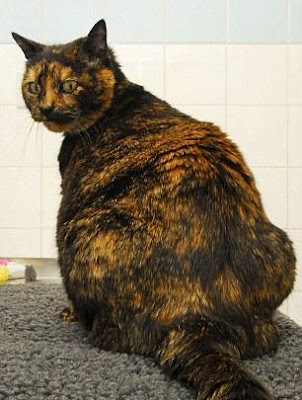 'Because he's long-haired I hadn't noticed how big his belly was getting,' said Mr Duncan from North Shields, Tyne and Wear.